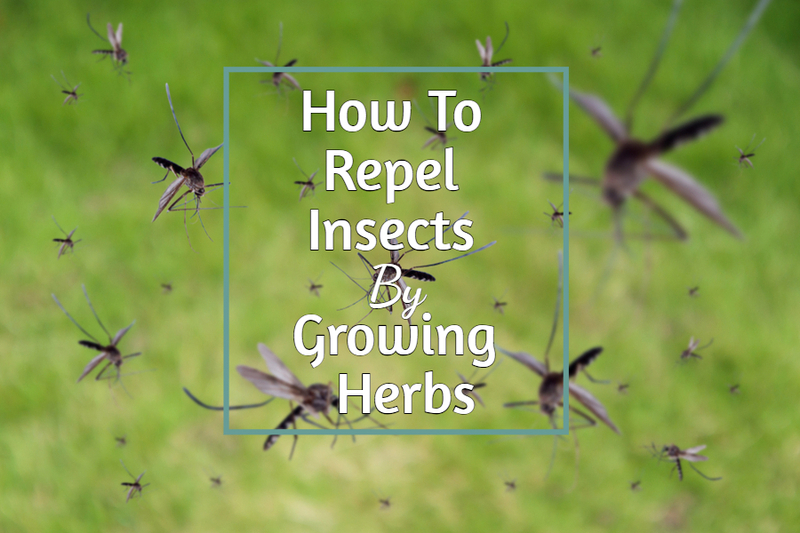 How To Repel Insects With Herbs - Keep Mosquitoes, Gnats & Flies Away! Looking for an all-natural away to repel insects? Then growing a few herbs in your garden patio or porch just might be the answer. Nothing can spoil a beautiful day or an evening outdoors like a few pesky mosquitoes. Or for that matter, flies, gnats and even ticks! But believe it or not, many herbs have incredible built-in pest repelling qualities that help keep insects at bay. Even better, herbs are easy to grow from seed in pots, containers, or right in the landscape. And in today’s gardening article – we highlight six of the best! We have included seed links with each herb listed as well. Rosemary is a wonderfully fragrant herb that works extremely well in repelling ticks, mosquitoes, and flies. Rosemary can be grown in the landscape as a perennial. Or, grown in pots that can be brought inside during the winter months. Rosemary can be growing directly in the landscape or in pots. A few planted pots on the patio or porch are the perfect remedy to keep those pesky flies and mosquitoes away. Rosemary can also be dried and hung in a small bouquet in the kitchen for the same effect. Basil is not a just an incredible culinary herb. It is also one of the best all-natural fly and mosquito repellents around. Grown in small containers or pot, it’s fragrant leaves and blooms are despised by flies. Outdoors, small potted plants make the perfect centerpiece for summer outdoor eating spaces. Basil is also wonderful to plant in the garden. It is well-known to protect growing tomatoes from invading pests. And to boot, when grown nearby, it is said to improve their flavor! Looking for an all-natural pest repellent for your skin. Then lemon balm is the answer. Lemon balm is a perennial plant that is a member of the mint family. It grows well from seed. The leaves of lemon balm can be crushed and then rubbed on arms and legs to keep mosquitoes away. The fragrant and pest repelling leaves of lemon balm. Simply cut back each fall and the plant will respond with new growth. It also can be grown easily in pots and containers. Lavender is perfect for repelling moths, mosquitoes and fleas. When grown at the edge of gardens and flowerbeds, it provides a living pest barrier. The beauty of lavender blooms. In addition, leaves can also be soaked in water to create an all-natural bug repellent. To make, crush or blend the leaves in a container of water. Next, simply let the mixture steep overnight. Then strain and pour into a pump bottle and you are ready to go! Catnip has always been known to attract cats. But is also excellent at repelling mosquitoes. Everyone knows that cats love catnip. But did you know that it is a wonderful repellent for mosquitoes too? The leaves of catnip can be crushed and steeped in water for 10 to 20 minutes. It creates a very powerful mosquito repellent. Of course, cats may find you a bit more attractive in the process! Peppermint serves a dual purpose when it comes to insect control. Not only does it help to repel insects, it also relieves itching and burning skin from bug bites. It is always a good idea to grow any member of the mint family in pots. They have aggressive root systems that can take over bed space. Simply crush a few leaves of peppermint and rub on bites. It will instantly soothe the skin from burning and itching. Although a perennial, mint should be grown in containers.